Ubisoft is revving up Driver Renegade 3D for release on the 3DS this spring, and they've just delivered some high-speed details on what they're claiming to be the first action driving game on the system. Taking place between the events of Driver and Driver 2, the new game will follow John Tanner who, after years of undercover work on the force, decides to take matters into his own hands, law be damned. He goes after the five kingpins who rule the city – a drug dealer, a human-organs trafficker, a pimp, an arms dealer and an over-greedy trader – using his weapon of choice: his car. Driver Renegade 3D will take place in an open world setting based on New York City. You'll be able to charge your Rage Bar for better attacks by performing high-speed feats and jumps as you take on the title's 20 story missions. The game will include 50 unlockable cars, 70 challenges and tracks spread over the city and seven challenge types, among them Time Attack, Elimination Mode, Road War. After years of undercover work on the Force, John Tanner wants to take matters of crime in his own hands, regardless of what the Law dictates. In a corrupt New York City run by criminal mobs, Tanner saves Senator Ballard’s life. He needs help in leading a crusade against Crime. Tanner accepts to clean the city off the record, against the Senator’s protection. Tanner becomes a renegade and must take out five kingpins: a drug dealer, a human-organs trafficker, a pimp, an arms dealer and an over-greedy trader. Helped by his few friends, with no badge to hold him back, Tanner wages his war against crime with his weapon of choice: his car! Driver Renegade is the first and exclusive action driving game on 3DS that lets you experience the intensity and brutality of urban car chases in 3D. Drive recklessly, perform jumps to fill your Rage bar and unleash devastating takedowns on your enemy cars! Discover the open world and the landmarks of New York, the city of all crimes. Experience a 3D-enhanced sense of speed and immersion within the guts of a vast modern city. Drive fast, take risks, destroy criminal activity locations, perform jumps to fill your Rage Bar and unleash devastating attacks on your enemies, ram them, and finally take them down! Discover the 20 story-based missions, all delivered with a unique, cutting-edge 3D style. In this story set between the events of Driver 1 and Driver 2, Tanner confronts enemies full of vices. He also meets new enigmatic allies that will help him take on the most corrupt parts of New York City. But will that be enough to obtain a sense of Justice? Unlock up to 50 different cars and tune them up in your private garage. 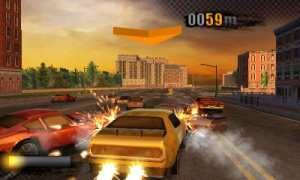 Over 70 challenges and tracks spread all over the city will put your driving skills under stress. Choose among the 7 types of challenges (Time Attack, Elimination Mode, Road War…) to compete against deadly AI opponents. This game sounds interesting and the screen shots look pretty cool. I can't say that I'm familiar with the Driver series but I'll probably give this game a try. I would love to hear more about it though. I would prefer 20 cars and 50 missions. 20 doesn't sound like a lot. I have played the first driver and enjoyed it very much. This could have a lot of potential. Will wait and see.